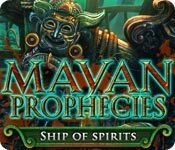 Free Mayan Prophecies: Ship of Spirits download for PC - Full Demo or Buy it now at PopGamers.com! Climb aboard an ancient Spanish galleon lost in time as a Coast Guard officer tracking an elusive criminal in Mayan Prophecies: Ship of Spirits. As you explore the vastness of a ship lost in time, what mysteries will you uncover amidst its Mayan idols, menacing sea creatures, and exotic treasures? Find out in this exciting new Hidden Object Puzzle Adventure game on the open seas!